One thing most Canadians don't realize is, every time you make a purchase on your credit card that isn’t in Canadian dollars, you are charged a foreign transaction fee in addition to whatever the current exchange rate is for the local currency. That fee is almost universally 2.5% of the total transaction. If you are making a lot of purchases that are in foreign currencies, whether online or on vacation, these fees can add up quickly. There used to be a few Canadian cards backed by Chase Canada that had 0% foreign transaction fees, but the last of those publically available cards disappeared in the summer of 2017. Thankfully, we haven’t been left high and dry, with many credit card issuers (like Scotiabank, Home Trust, Brim Financial, and Rogers Bank) are stepping up and providing the Canadian credit card market what it wants the most. If you do the majority of your shopping, vacationing, or business traveling in the United States especially, it is definitely worth carrying a card with reduced foreign transaction fees or increased bonuses. Review all top 10 foreign exchange credit cards here. 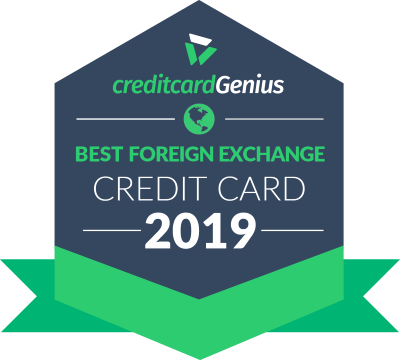 Coming in at number one for the second year in a row as the best foreign exchange travel credit card is the . 1 Scotia Rewards point for every dollar spent elsewhere. And with 1 Scotia Rewards point worth 1 cent when redeemed for travel, you're getting a solid 1.3% return in spending. This card also gives cardholders a great insurance package, travel perks like 6 free lounge visits annually, and, most importantly, 0% foreign transaction fees. There is a lot to like about the Rogers Mastercards, most notably the ability to earn up to 4% on foreign exchange purchases and their lack of annual fees on their credit cards. Although Rogers Bank doesn't actually waive the foreign exchange fees, the 3% (or 4% for the Rogers World Elite) that you'll earn definitely offsets them, netting you 0.5% (up to 1.5%) on purchases made in a foreign currency. A popular card among Canadian credit card users for no foreign exchange fees is the . Coming in to dry our tears after Chase broke our hearts, I think it's safe to say that Home Trust may have been overwhelmed with the demand they received for their no fee card. And it comes to no surprise. For no annual fee, this card gives you 1% cash back on all of your purchases, with no limits as to how much you can earn. But it doesn't end there. This card provides you with a free basic roadside assistance plan to help you get on your way when your vehicle breaks down, needs a battery boost, or you get accidentally locked out. And if this isn't enough, it comes with some basic insurance coverages – purchase protection and car rental insurance. Home Trust has a great card to consider here that goes beyond waived foreign exchange fees. If you haven't heard of Brim Financial credit cards, that's because they are relatively new to the game, having only approved their first card applicants around July 7, 2018. That being said, there was definitely a lot of hype around these new credit cards when they were first announced, mostly because this new suite of cards would be waiving the foreign exchange fees. Not only that, but all 3 of its cards would be providing its cardholders with complimentary Boingo Wi-Fi and the elusive Mobile Device Protection insurance. Brim had a difficult launch, and it was several months after they started taking applications before people finally got any communications, not to mention customer service was also non-existent during this time. Things seem to have gotten back on track for now, but only time will tell if Brim Financial will stand the test of time.